The extremely versatile 4" Adrenaline Bug is designed to provide a great creature bait presentation that bass love! The soft, body and floating claws make this bait irresistible to bass. Once they feel this soft bait in their mouth - they will not let go. 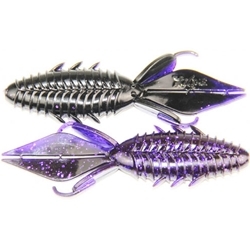 The specialized plastic, super fine salt and scent infused formula used to make the Adrenaline Bug allows the claws to float at rest for a time, mimicking the defensive stance of a real crayfish. All of these exceptional features produce a creature bait that swims, hops and undulates in the water creating a NEW unique sonic signature and vibration that BASS LOVE!! !